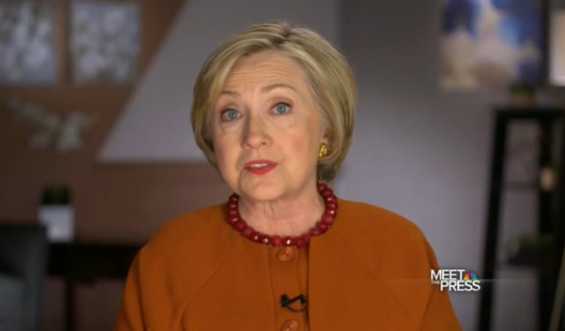 In an interview on NBC’s “Meet the Press” on Sunday, Democratic presidential candidate Hillary Clinton used the phrase “unborn person” when speaking about abortion, but asserted that the unborn do not have constitutional rights. Todd then asked Clinton if unborn children have rights, and if so, to outline when. She replied by referring to the unborn as persons, but asserted that they don’t have rights under the U.S. Constitution. “Well, under our laws currently, that is not something that exists. The unborn person doesn’t have constitutional rights,” she said. Following her comments, a Planned Parenthood representative took issue with Clinton referring to the unborn as human persons. “@HillaryClinton further stigmatizes #abortion. She calls a fetus an ‘unborn child’ & calls for later term restrictions,” Tweeted Diana Arellano of Planned Parenthood Illinois Action. Others marveled at how both Clinton and Todd finally acknowledged the personhood of the child in the womb.